In the world of presentations, it is very important to use images…but the right ones! Try to use metaphors. It will look very professional if you use more abstract images that support your words not directly, but give the audience the feeling, mood, voice you want to achieve. 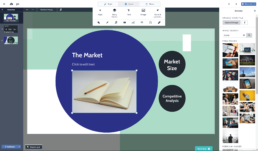 In Prezi, you can add images to a topic, subtopic, or directly to the presentation canvas. From Prezi’s image library. However, it’s important to know that you can use more than 500,000 images if you pay for Prezi Edu plus. 3. After you choose your image just double click on it or drag and drop it on your canvas. 4. Then you can move, resize or rotate the image. If you have the paid version of Prezi you can even edit your photos. 1. Click on the image that you want to change. 2. Click the right button on the mouse and choose Replace image. If you have image or shape that you want to move above or under another image or shape just right-click on an image and select Bring to the front or Send to back to move it. The background image is very important for the look of your presentation. This is the main layer that you play around with other objects and text above it. First, you must think about the background, which depends of the story you want to tell. Where you will put the other objects as well as text, charts, and images. To search images in the Prezi library. 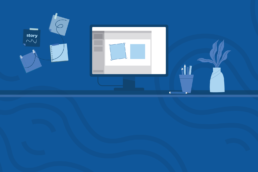 You have 16 free images and if you want more you need to have Prezi Edu plus. You can even choose a color as a background to your presentation. If you want to bring back the original background image that came with the template, just click Revert to original button at the bottom of the sidebar. To remove the background image completely, click the Trash icon.